St. Patrick's Day crafts can all be found here! March is that wonderful time of year where we all come together, Irish or not, to celebrate St. Patrick's Day. Irish people are known for their fun attitude and love of life, so it is extra fun to celebrate this holiday! Many of these craft ideas are things you can wear to help dress up and celebrate the big day... things like hair clips, pins, and necklaces. 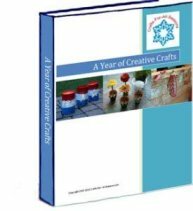 In addition, you will find many craft projects easy enough for children. I have several polymer clay projects listed. Each project has step by step instructions, so even if you haven't worked with polymer clay before you will be able to complete the project. My favorite polymer clay project on this page is the shamrock, because it is so simple to do. The polymer clay shamrock can be used in many different projects! Another favorite is the pasta shamrock. Once again, the reason is because it is so simple to make but it looks really nice! These are both inexpensive ways to make your own jewelry or accessories. These work really well as magnets or to be attached to a hair clip. The shamrock wreath is a beautiful decoration for your front door. It is created using three foam heart shapes, and wrapped it with green crepe paper. Pretty pearl headed push pins are added throughout and it is completed with a beautiful bow. A children's favorite is the paper plate leprechaun, and his curly beard is the most fun. The paper is curled by rolling strips around a pencil. Do YOU have any St. Patrick's Day crafts you would like to share? Let's add it to the collection. Click here! The crafts that appear below were submitted by visitors. Thank you for sharing your creativity with others! Click Here to Submit a St. Patrick's Day Craft of Your Own! If you would like to see more St. Patrick's Day crafts have picked by me, please visit by page on Pinterest.